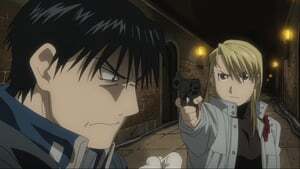 Riza sees through Envy’s disguise as Roy and shoots him until the real Roy arrives and mercilessly incinerates the homunculus, reverting him back to his parasitic form. Before Roy can kill Envy, Ed, Riza, and Scar persuade him to let go of his anger and his need for revenge, for Amestris cannot be ruled by someone consumed with hatred. Envy becomes outraged by Roy’s change of heart and rants about why everyone does not kill each other, trying to goad them into doing so by pointing out all of the terrible things they have done to each other. Ed determines that the reason Envy hates humans is because he is jealous of their capacity to continue living on, despite all the abuse they take. 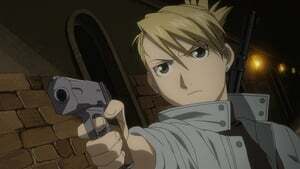 Humiliated and insulted by how Ed understands him, Envy commits suicide by tearing out and destroying his own Philosopher’s Stone. Meanwhile, the Armstrong siblings begin to gain the upper hand in their battle against Sloth; Izumi arrives in Central, allied with Briggs soldiers, to participate in the coup; and Hohenheim confronts Father alone.